Georgia Adler might be from a small town near Atlanta, but don’t call her a peach! Before the release of her debut novel, a top literary critic reviews her book as a “contemporary masterpiece of epic proportions.” As a result, Georgia is named one of America’s most promising new authors. When her agent sends out a press kit with her photo—which Georgia expressly instructed her not to include—magazine editors and talk show promoters across the country clamor for her attention. Against her better judgment, Georgia reluctantly grants a few interviews, and a whirlwind publicity tour begins. After the first few press stops, the frustrated young novelist regrets the lack of privacy and not writing under a pen name. Instead of happily writing at home in her jeans and T-shirt, she’s all dolled-up and being promoted as something she’s not. Why did things have to get so complicated? Grayson Chambers walks into a tempest when he visits his friend Nick in Manhattan. He’d only planned on lunch, but a new female novelist who’s taking the literary world by storm is being interviewed. As the managing editor of a trendy New York magazine, Nick’s in desperate need of an immediate replacement for the ailing male model. Swallowing his misgivings, Gray steps in to model professionally one last time. He can tolerate working with a demanding, beautiful diva for a few hours if it’ll give him the opportunity to publicize his foundation to thousands of people. He’ll be paid extremely well for a short time in front of the cameras, so what could be the harm? It’s a win-win situation. After Georgia meets the devastatingly handsome Grayson, she begins to question the very crux of her novel, and Grayson wonders if the basis for his foundation is misguided. Is this a “chance” meeting between them or a way for God to reveal His own plans for their lives individually or perhaps even…together? As the daughter of a lighting technician and a costumer, Madalina (“Madi”) Pavel grew up in the shadows of the famed Metropolitan Opera House in New York. To fulfill her twelfth birthday wish, her parents dressed her in a beautiful gown and positioned her beneath the spotlight at center stage. Young Madi poured her all into an aria, blissfully unaware the opera’s general manager listened from a seat in the darkened theater. Now 26, after extensive training and traveling the world, Madalina is the coloratura soprano understudy for the Met Opera who seeks the breakout role of a lifetime. Julian Rhodes is the owner/manager of Harmonia, a popular Manhattan breakfast bistro frequented by the Met staff and performers. While Julian depends on their patronage, he secretly finds the opera tediously boring. He devotes all his energies into making his restaurant a success, but when he meets the beautiful coloratura soprano, Julian begins to rethink his priorities. 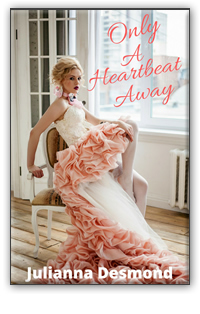 Can a romantic relationship survive between a workaholic business owner and a promising opera singer? When Madalina is offered a fabulous career opportunity, their love is put to the test. Are Julian and his beautiful coloratura soprano meant to be, or are they destined to part ways? Come backstage for a firsthand look into the fascinating world of the opera where stories are beautifully and passionately told through drama and song. 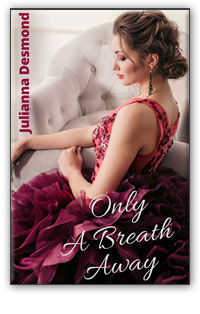 Only A Breath Away examines how faith in Christ, close family ties, and the strong bonds of friendship can help a young couple juggle the hectic demands of their individual careers while navigating the sometimes murky waters of romance. And how through the unpredictable twists and turns of life, God can make the seemingly impossible…very possible indeed.